Allows students to visualize magnetic fields. 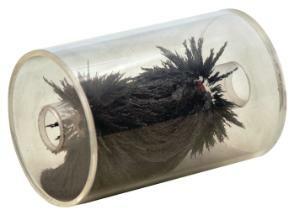 This magnetic field chamber is great for the classroom. Extremely useful for students to visualize magnetic fields in three dimensions, instead of the usual two dimensional of most iron filings field visualizers. Perfect for demonstrations or to pass around the class for hands on experience. Iron filings sealed inside chamber so no worrying about loose filings. Insert a bar magnet, up to three-quarters of an inch in diameter, into the inner chamber and view the three dimensional magnetic field lines appear before your very eyes. Magnet is included.